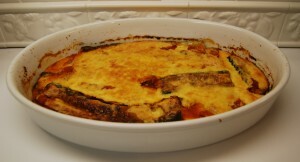 I adapted this recipe from my favorite Eggplant Au Gratin recipe. I just substituted 2 pounds of zucchini in place of the large eggplant. Since I didn’t have tomato sauce, I decided to try salsa – what a fabulous addition! I used the mild flavor salsa in this recipe but I love the hot salsa too! Preheat the oven to 400 degrees. Spray a 9 x 9 square casserole dish with cooking spray. I used an 11 x 7 oval dish that I recently purchased at Wegmans and I love the different look! Heat the 1 tablespoon of oil in a very large frying pan over medium heat. When the oil is almost smoking, add the zucchini (fry in 2 batches if needed) and COVER with the lid. 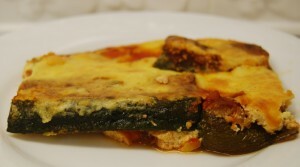 This allows the zucchini to cook quicker, and uses much less oil. When browned, turn over each slice, and if needed use cooking spray to moisten the pan prior to placing down the uncooked side. Fry until the slices are fully cooked and tender. Transfer and lay flat the cooked zucchini slices into the casserole dish. You may have to stack some of the zucchini. Pour the Chi-Chi’s salsa evenly over the zucchini layer. In a small bowl or small food processor, mix together the ricotta, egg, light cream, pepper, and all except for the 2 tablespoons of the Parmesan Cheese. Then pour the ricotta mixture over the zucchini and salsa layers. Sprinkle remaining 2 tablespoons of Parmesan Cheese over the top. Bake for 25 to 30 minutes or until the custard sets and the top is browned. Enjoy! 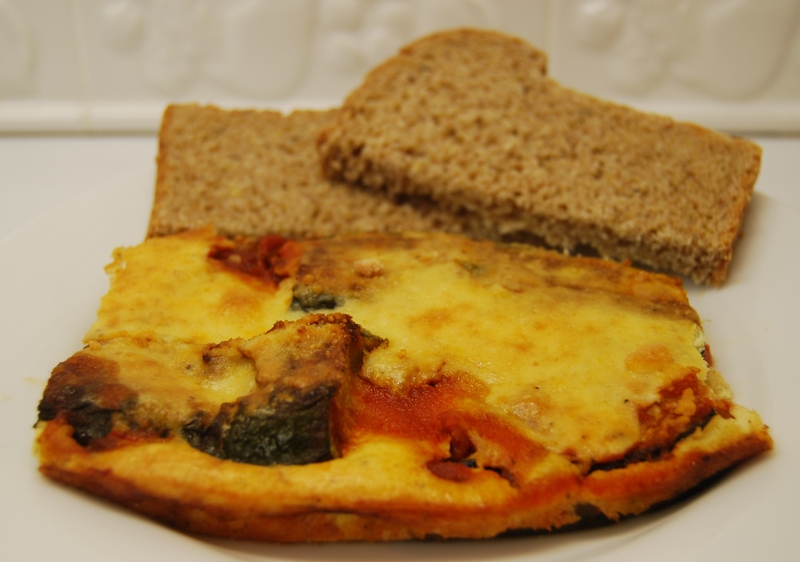 Add a slice or two of Health Wise 1 Net Carb Bread and you have a 2 carb meal! Go to: LowCarb-R-Us.com to order the this 1 net carb bread and save 10% on your FIRST time order with LowCarb-R-Us.com! Simply add “CLL” (a Carb Light Living™ exclusive offer) in the coupon code box at check out. Stock up – try all the delicious bread products from the Health Wise and Health Express lines via LowCarb-R-Us.com and save 10%. Select the bread, and any additional items sold by LowCarb-R-Us.com – you get 10% off everything! NOTE regarding shipping: Southern California has overnight delivery through ground shipping and Northern California, Arizona, Nevada, & Utah are 2nd day using ground shipping. * If ordering certain perishable items and the order will not arrive by the week-end, we may hold your order and ship it Monday so your items will not sit in a warm non-temperature controlled warehouse over the week-end.